I’m teaching the Baby Sweater from my Layette Set in Knit Simple Fall 2010, and I decided to go ahead and work up a sample for Yarnivore while I teach. Knit Simple was kind enough to temporarily lend me the actual sample to display in the shop, which is great–but this one can live there when that’s gone. *Yes, these flip-flops are still kicking. I worked the smallest (0-3 months) size in Berroco Comfort DK, but made mine with short sleeves. My goal was to work the whole thing out of 2 skeins (Grand total, $7. Yes, you can buy inexpensive yarn at your LYS). I still have to edge it but I think I’m going to have enough. Hooray! I thought I’d show it to you on my blocking board because blocking is still a big mystery to a lot of crocheters. I’m not going to lie–for a very long time, I didn’t know what blocking was either. But when I started researching Crochet Adorned and working in yarn shops, I realized how dramatically it can improve the look of your projects. Here’s how I think of it. Let’s say you have a nice pair of pants. They’re going to look better if you iron them, right? Not everyone does, but you look more professional when you take the time to do it. Well, ironing is to those pants what blocking is to crocheting and knitting. (Note: I am in no way saying to actually iron your needlework!). Blocking doesn’t have to be hard, at all. The first thing you need is a surface. I bought the foam tile pieces shown above from Lowes– a pack of four 2×2 tiles cost me $20. Since they are modular, I can change the layout to block scarves, baby blankets, sweaters, doilies, etc. They are nice and thick and I lean them against the wall to get pinned projects out of the way while they dry. As a designer, I sometimes have several things blocking at once. It took me 8 years of crocheting to “splurge” on the blocking board and I’m so glad I did. There are other surface options too, but this is my favorite. Unlike a padded ironing board or a towel on a bed (my old standbys) the foam doesn’t absorb the water, it just lets it evaporate on the surface. That means faster drying time for my stuff. So, to block- hand-wash your pieces BEFORE you put them together. 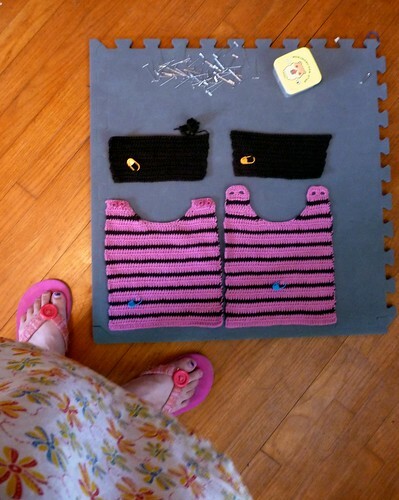 It’s much easier to sew things together that are the same size. It’s also much easier to see if there’s a glaring error BEFORE you sew things together, so you can fix it without having to rip back your seams. You can even leave your ends free until after you block if you think you might have an error. This would be especially useful if you expect the length of a piece to grow, and want the option to shorten it. I usually do weave my ends in, but before that I mark the right side of each piece with a marker so I don’t get confused later. Trust me, it’s easier to set up a visual reminder than to try to guess– I learned that lesson the hard way when I sewed a set-in sleeve in backwards once. Don’t worry, the recipient never noticed and I never told her. Anyway, back to blocking– pin the wet pieces into place with T-pins (rust-proof metal pins). Stretch them gently, if necessary, to match the schematic or desired measurements. Let them dry. That’s it! And, if you’re in a hurry or just want to do a light block, you can just spray the piece with water until it’s saturated, and repeat the rest of the procedure. Try it a few times, and I’m sure you’ll see the difference. 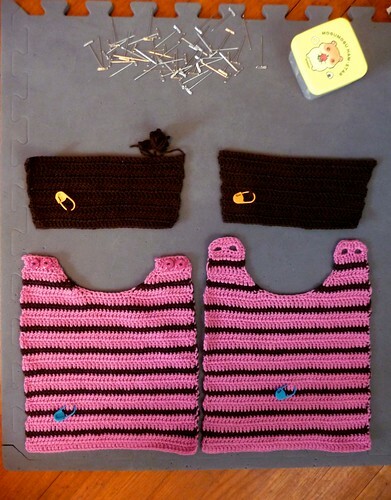 Monday night is the last class for the Baby Sweater and we’ll all be sewing our pieces together (hopefully!). I’ll be sure to share the finished sweaters when I have a chance. I’ll offer the class again in a month or two, and I know my friends at the Bozeman Yarn Shop are offering it for fall, too–call them if you’re interested. And in case you’re curious, the September classes are on the Yarnivore calendar. PS: Still time to enter the giveaway, if you’re reading this before midnight, Wednesday 8/18/2010. thanks meghan, that's a good idea too, i guess it was the cardboard that always worried me (i've been known to do a quickie block by spraying the piece on the board....). glad to hear it has held up! for those who want measurements but not expense, look for 1" gingham checked fabric at the fabric store and lay it over the board--you can use the lines to measure and match straight edges. I had no idea I had a blocking board until a couple of days ago when I realized that I could use my daughter's huge Dora foam puzzle :-). yep! those work perfectly too and are even more modular cause they're smaller pieces.